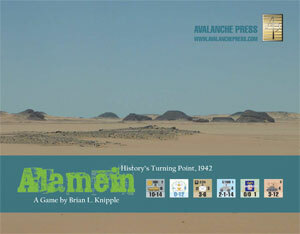 Alamein is, as far as I know, the first game ever published covering all aspects of the battle of Alamein. Lost somewhere between the earlier desert battles of maneuver and the later, inter-allied operations in Tunisia, it is often discussed but seldom gamed. With the publication of Alamein, that has changed. The game provides players with the opportunity to examine a unique engagement where the initiative completely changed from one side to the other and where, for a few weeks, the British Empire came closer to disaster on the battlefield than at any other time in the Second World War. The most powerful formations in your arsenal are the two German panzer divisions. With plenty of excellent tanks and a powerful infantry regiment, each is capable of obtaining multiple positive combat odds shifts in almost every situation, making them all but unstoppable. Their weakness is insufficient infantry to hold the ground taken. The 9th Light Division comes close but lacks the armor. With plenty of infantry, it can do what the panzer divisions cannot, hold an extended front. With tank support it can take it as well. The 164th Infantry Division is powerful, but better suited to holding ground than taking it. The two Italian armored divisions are not the equal of their German counterparts, but can attack if supported by sufficient artillery and not opposed in great strength. Like the German armored formations, they are not capable of holding much ground in the defense. The 101st and 102nd Infantry Divisions are weak in infantry with only two regiments, but can stand if in good defensive positions and well supported by artillery and anti-tank weapons. The remaining Italian infantry divisions are good for little more than defending opposite weak Allied formations or for slowing a determined attack. The two parachute divisions are excellent formations and with tank support can attack. In defense, the two are nearly unmovable. Attacks must be tuned to the Allied units being attacked. Outside of defensive positions, a German armor-infantry attack with three or more artillery battalions, an infantry regiment bonus or two, two morale shifts and at least one armor shift makes for an extremely effective combination. Enough infantry must be involved and in nearby hexes to ensure that the advance isn't on so narrow a front as to allow a British counterattack to regain the ground taken or trap the advancing units. When attacking, engage adjacent units in zones of control and threaten them with being surrounded. If available, use artillery to bombard adjacent British positions not being attacked. If adjacent British units can be disrupted, an advance after combat may force the British player to fall back elsewhere to avoid presenting a weak point to attack. The better Italian formations can be included in attacks and are always good for securing your flanks. It is dangerous, but almost always necessary to stack two or more battalions in a hex in the advance after combat, but if a leader is present it may present an opportunity too great to pass up. The British artillery and their lavish supply of ammunition are the greatest threat and can turn a powerful formation into a disrupted or demoralized rabble. On the defensive, mix the German and Italian units because many of the Italian formations are unable to defend effectively alone. Do not mix units of different Italian divisions unless absolutely necessary (and it will be sometimes), but sprinkle German units throughout in order to allow for a higher morale on the defense and to reduce the possibility of surrender. Entering the map in pursuit of the British Army fleeing after the fall of Tobruk, the Axis formations are already seriously understrength. Speed is your friend and step losses your enemy. With the exception of the 2nd New Zealand Division’s two brigades, the Allied formations holding the Mersa Matruh position are also weak and, at least initially, unable to move. The first and best chance for an Axis victory lies in trapping a significant number of the British units in the Mersa Matruh position before they can retreat into the Alamein line. Historically the two British armored divisions took a pounding, the remnants of the 10th Indian Division all but destroyed and the New Zealand division almost trapped. By boldly advancing and attacking, you can force the British player to retreat faster than he planned and hopefully catch some units before they can take flight. To achieve this will require running some risks, and herein lies the real difficulty. The difference between a brilliant advance to trap one of the New Zealand infantry brigades and putting one of your panzer divisions into the hangman’s noose to be destroyed can be as little as a hex or a free unit able to counter a British move. All your formations are seriously understrength and in a stand-up fight lasting several turns can easily be worn down. When attacking it is important to have at least one free unit nearby to counter an advance or trap units committed to trap or counterattack your lead elements. This and your ability to accurately estimate your opponent’s willingness to stand and fight rather than run can be the difference between winning and losing. The Allied player will willingly trade both New Zealand brigades for the destruction of two of the German divisions. You cannot afford to lose even one unless the bag of British units is BIG. Presuming that you are able to trap some of the units at Mersa Matruh, but not so many as to completely undermine the defense of the Alamein line, you will need to follow up the retreating British and prepare to attempt the breaching of the defensive positions. Against prepared positions backed up by artillery, you will have to attack in strength and suffer losses. Attacking the Alamein line along the coast keeps your flanks to a minimum, but will be the most difficult to penetrate due to the fortifications and heavy concentration of artillery available to the South Africans. Attacking in the center of the line is easier, but requires the leaving of flank holders to secure the corridor you will be making (do not expect the British to retreat from the position easily). Attacking in the south is easier still, but brings with it a host of supply and extended flank problems that quickly become serious. While mounting your attacks keep an eye on your supply points as they are your bloodline and squandering them needlessly will result in your formations being unable to react to British attacks or counter intensive air operations. If you are unable to break the British line early, you will need to build up your formations with replacements, build defensive positions (improved positions, fortifications and minefields) to allow your weaker formations to hold the line while the better ones are rebuilt; all the while building up your reserves of supply points and artillery ammunition. Regardless of the situation, take every opportunity to attack weak British units. Eventually the growing strength of the Eighth Army will become irresistible and every battalion you destroy without loss to yourself will delay the day that the British offensive begins and give you that much more time to prepare your defenses. Allied formations vary little in quality with the Dominion troops (Australian and New Zealand) being the best and the rest good, but not great. Initially your tanks and infantry will not work well together and only gradually get better as doctrine improves. You should rely on anti-tank guns and infantry to blunt attacks and artillery to weaken the attackers and force them to withdraw. With lower morale and generally weaker units, you need to ensure your positions enjoy whatever advantages can be found. Attacking are possible only against weak Axis (read Italian) units or in conjunction with massive artillery firing in support and on barrage missions. Combat odds shifts are mostly in the form of brigade integrity (keep your brigades together) and your superiority in artillery and artillery ammunition (keep your artillery positioned to provide support to the greatest number of frontline positions). Because your formations suffer when attacking together, it is essential to keep then separate and distinct, recognizing that early on this may not always be possible. Luckily you have a large number of independent units and these can strengthen a weak brigade or hold an extended flank. If your supply of anti-tank guns runs low, don't be shy about breaking down some of the 25-pounder battalions into anti-tank companies. Remember that you have a large pipeline bringing you replacements and several large formations due as reinforcements. Unlike the rapier, two-stack attack by the German panzer division, a British attack may consist of six to nine battalions of infantry making up at least two complete brigades and supported by one or two tank battalions and six to 10 battalions of artillery. What you cannot get in combat odds shifts can be had by getting the attacker side of the ratio as high as possible and bombarding the defender prior to the attack. Your artillery is quite literally the “queen of the battlefield.” You have both a large number of artillery battalions and sufficient ammunition to fire them lavishly when needed. If the Axis player stacks two battalions' worth of units in range of more than one of your artillery units, bombard them. While your replacements are many, they should not be needlessly squandered. With many eliminated or reduced infantry units at start, it will be necessary to rebuild them. Above all else, be patient. You must first weather the Axis assault. The early attacks on your positions will be strong and you will lose units and expend much artillery ammunition defending against them. Once the Axis attack has been held, begin a careful program of saving artillery ammunition and supply points for the day when you attack. You should plan on needed enough supply points to operate 2/3rds or more of your army in a prepared condition for 10 days and sufficient artillery ammunition to fire all your artillery units continuously for those 10 days. When you attack, the cost will be high, but you have the formations and replacements to trade even or worse in step losses and still break the Axis line. Axis attacks will usually inflict losses on your defending units, but if you can keep your line more or less intact, artillery barrages and counterattacks (later in the game) can force long-term unsustainable losses on your opponent. Second South African Division must hold the coastal region and 2nd New Zealand Division the center. Divide the majority of your tanks between the two formations. It is important to get the 50th Infantry Division back up to strength as it will be needed in the front and with its two brigades can very effectively hold four to six hexes of it. Due to their low initial strength and slow reinforcement rate, the Free French brigade is not suitable for significant combat operations and if left in even a slightly vulnerable position, will be targeted by the Axis player. If you can keep from losing the 18th Indian Brigade, it will be a welcome addition to the long-term defense of the line, just remember that it is the best brigade to sacrifice if one must be lost. As soon as you can muster an extra infantry brigade and some artillery ammunition, you will need to attack thinly or weakly held portions of the line. The regular Italian infantry divisions make excellent targets and bleeding them forces the better Axis units to be regulated to a defensive role. The one area in which you are never on the weak side is the air war. It is essential that you maintain pressure on the Axis. Depending on the current situation, you can tailor your air missions to most effectively interfere with Axis operations. If you believe the Axis will conduct attacks against your units during the upcoming day, assign aircraft to the harassment mission so as to interfere with movement. It is never a bad thing to place aircraft on the supply interdiction mission in order to reduce the Axis pool of supply points and artillery ammunition as it is your opponent’s greatest weakness.